Phew! We are nearly at the end of May and I am still going through my birthday posts! Five so far and five more (including this one) to come. In my, admittedly weak, defence, some of these meals weren't part of my original birthday plans but were birthday gifts from very generous and similarly food-minded friends. With that in mind, let me tell you that I was absolutely thrilled when my friend Alaina suggested a dinner at Prix Fixe as a birthday gift. 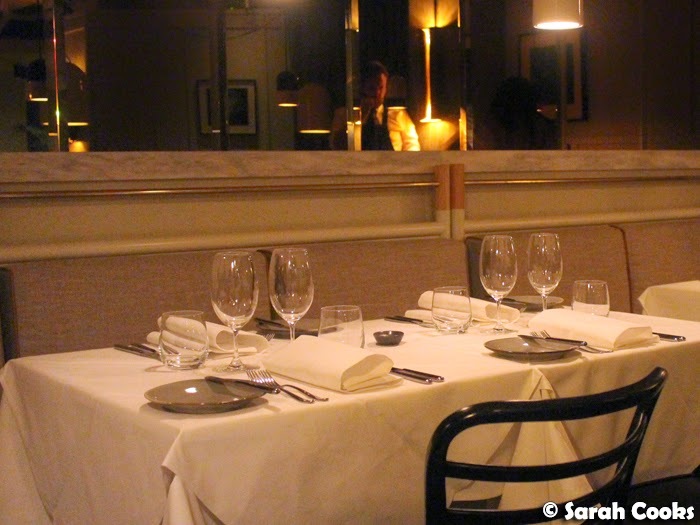 Prix Fixe is the new venture from pastry (and all-round) chef extraordinaire Philippa Sibley, whose schtick is that it is a ticketed restaurant, with a new four-course themed menu released each month. Essentially, see if you like the theme, buy and pay for your tickets in advance, then visit the restaurant at the appointed date and time. I hate queuing, and love scheduling things in advance, so I am firmly in favour of the ticketing concept! And if it makes things easier for a restaurant and helps with waste and resource management, then that is a win-win situation! 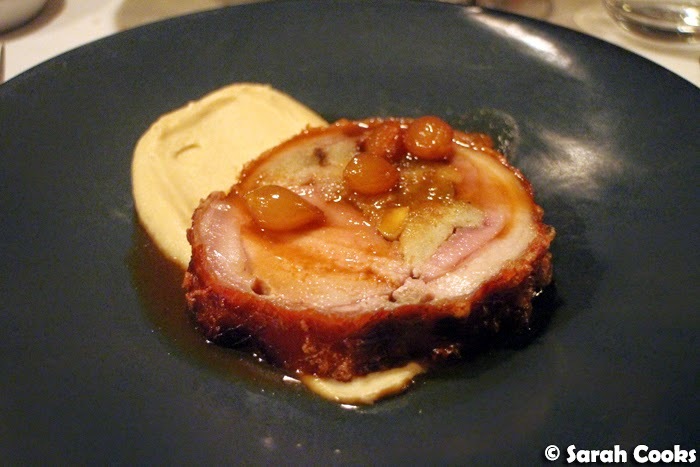 Given how busy the end of April was for me, we could have waited until later in the year to visit, but the April menu was The Whole Hog: three courses of Western Plains Pork followed by a Philippa Sibley dessert. I definitely wanted to get in on that! (See my previous posts: Il Fornaio and A Luxurious Pre-Christmas Dinner for other Philippa dessert goodness). Luckily we found a night in April when we were both free - woohoo! 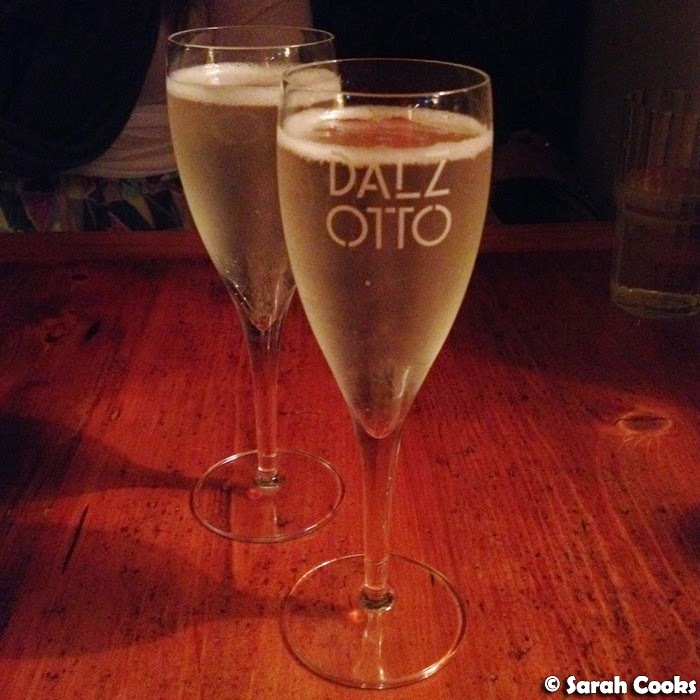 Before the meal, we popped into Il Solito Posto (4/107-113 Collins St, Melbourne VIC 3000) across the road for a cheeky prosecco. Cheers! Arriving at the restaurant, (within 15 minutes of the reservation time, as stipulated on the website), we were most impressed by the Fiona Lynch-designed interior - a moody and dramatic combination of textures (mirrors, marble, metal, linen, exposed ceilings, flowers and ferns), in a mixture of greys and retro pale green - kinda like Mildred Pierce meets Melbourne laneway. It really felt like we were being whisked away somewhere secret and special. Once we were seated, we were given the drinks menu, which included wines and a whimsical selection of themed cocktails. It's a shame we didn't know about the cocktails in advance (this info is on the website in the FAQs but neither of us saw it before the dinner), because as much as I love prosecco, I think it would have been even more fun to start the night with a themed cocktail. Oh well, next time! However, matching wines were available at a rather reasonable $55 per person, so despite it being a Monday night we decided to splash out. 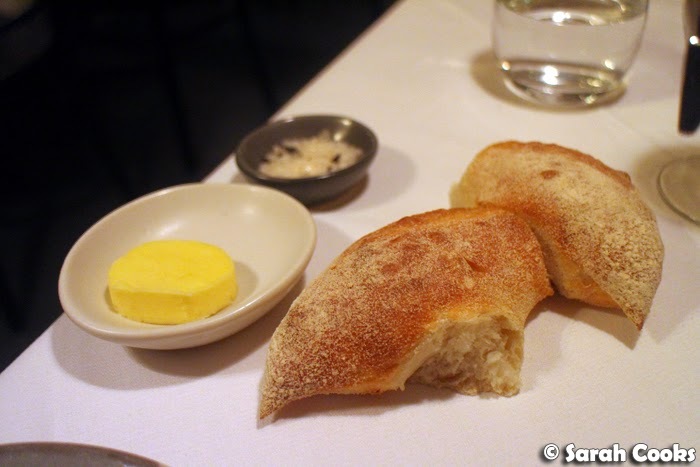 We started with some excellent pain d'epi, with sea salt and soft butter. 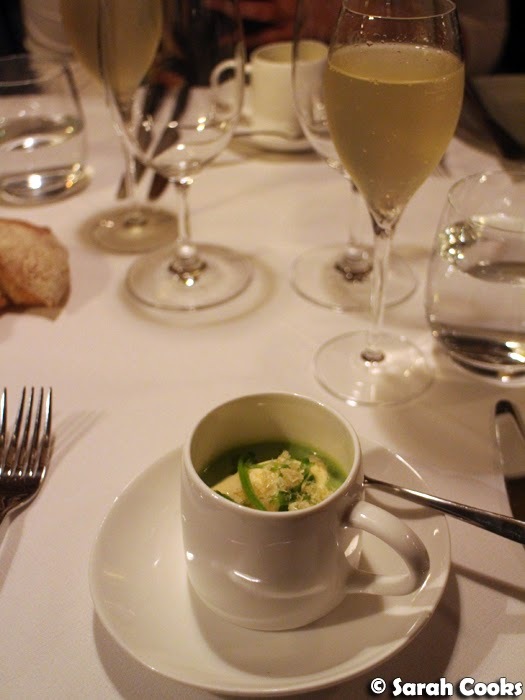 The first course was an amuse bouche of velvety smooth pea velouté, with a quenelle of bacon and egg ice-cream, fresh mint and crunchy pieces of pork crackle. The savoury ice-cream wasn't something I'd ever tried before, but I really liked it. The wine match for this course was a pear cider - the subtly sweet yet refreshing taste was a great match to the sweet pea soup. The second course was a combination of little bites, matched with a Burgenland rosé, a variety that I love and always think of as an easy-drinking wine. Starting from the bottom left, we have a sphere of watermelon, dressed in a prosciutto pashmina with compressed melon ears (it's Miss Piggy, see?). At the back was a perfect oblong terrine of lentils and ham hock, which came with a crunchy crunchy grissini (grissino for singular?) and a little dob of truffled mustard. 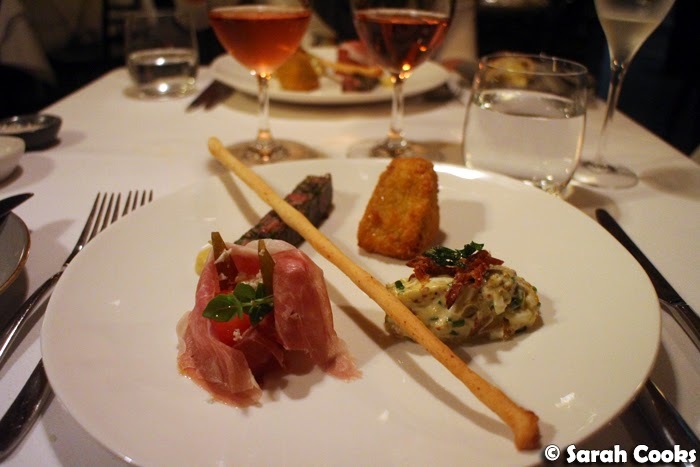 I loved the textures in the terrine - al dente lentils against the tender pieces of ham hock. Top right is the "Silk Purse from a Sow's Ear" - a stuffed and crumbed pig's ear. At first I wasn't sure about pig's ear, but it wasn't hard or tough, but rather had a pleasantly gentle chewiness to it. (Read Fuchsia Dunlop for an excellent description of the pleasures of cartilaginous textured food.) Finally we have the artichoke gribiche - think pieces of artichoke bound by a cold mayonnaise-style egg-based sauce - topped with yet more crunchy pig pieces. Delicious. Coincidentally, two of our favourite alcoholic drinks are cider and rosé (how hipster are we? ), so we were very pleased by the first two wine matches. The third course was where things got seriously porky - rolled pork stuffed with apples, served simply and confidently with a smear of creamy celeriac purée. I felt the crackling could have been, well, cracklier but the meat itself was tender and flavourful and this was otherwise an extremely good dish. 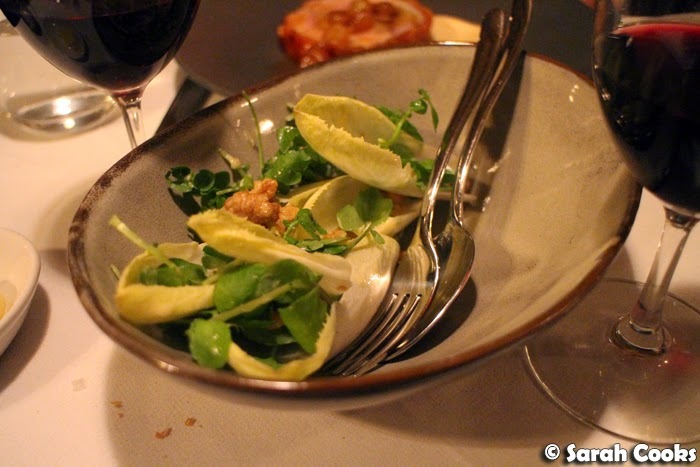 The accompanying salad - "brought to you by the letter W" - was a refreshing mix of witlof, watercress and walnuts, the bitterness of which was a great counterpoint to the rich, sweet pork. And finally... dessert! How pretty is it? We were staring in awe for ages before we finally dug in. Look at that amazingly glassy slice of pear! I must admit I wasn't looking forward to the liquorice "allsort", but the liquorice flavour was very subtle and I really enjoyed it! It was a prettily precise cube made up of sponge, chocolate, liquorice and vanilla (?) layers. 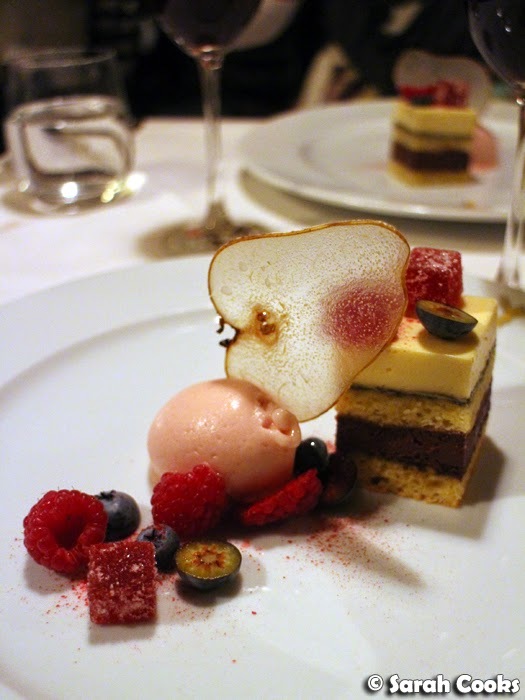 Accompanying were fresh berries, tiny squares of pâtes de fruits and a very pure-tasting pear sorbet. It was wonderfully balanced - not too sweet, not too large, not too rich, juuuuust right. What a way to end the meal! The matching wine was a rich Banyuls, quite syrupy and intensely grapey - I liked it, finding it similar to a muscat or a sherry. 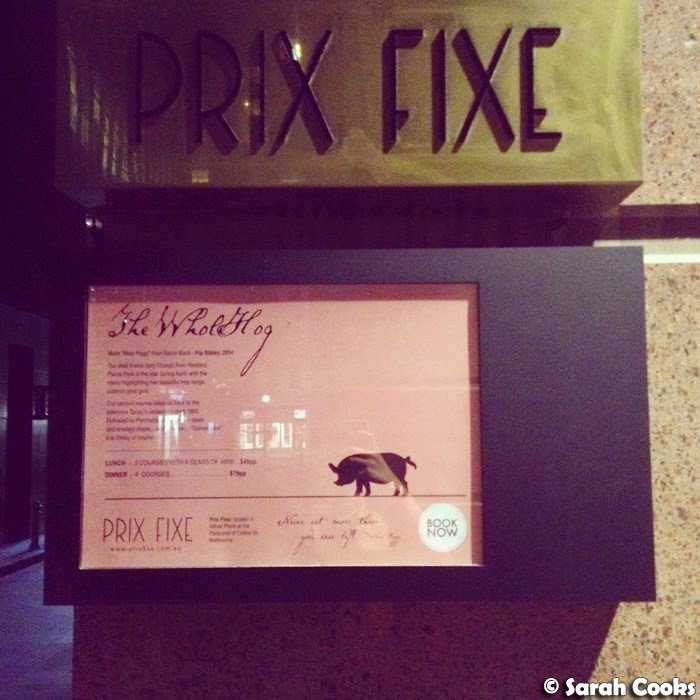 Obviously, The Whole Hog menu was only offered in April, so is sadly no longer available, but hopefully this post will give you an idea of the type of experience Prix Fixe offers and the quality of food that you can expect. We both really enjoyed the experience and loved the food. I get the feeling that there will be some slight changes and adjustments to the system as time goes on, more from a customer-education and administrative perspective than anything culinary. For example, at the time of my visit, all that was published online was a description of that month's theme, but now it seems that they're making the full menu available too. The Whole Hog was only their second menu, and there is a fine balance between letting potential customers know what they're signing up for and keeping that element of surprise which I feel is an essential part of the experience. Ahhhhhhhhhh the autumn menu blew me away!! We ended up having all 4 courses because you can have all 4 + wine at lunch for $60. Bargain!! The main, salad & dessert were highlights for me, as was the 'rooty remoulade'. In fact, I was slightly underwhelmed by the venison [carpaccio], but everything else was impeccable. Given the restricted menu I don't think Prix Fixe would be the best choice for a fussy eater, or someone with very strict or unusual dietary requirements. However, based on my experience, I believe that the adventurous eaters amongst us will love it. Book those tickets, enjoy yourself, and allow yourself to be surprised and delighted. Sarah's meal was paid for by the lovely Alaina as a birthday gift. All opinions are my own. Except for the ones I said were Alaina's. Wow what an incredible meal. And I'm transfixed by that window pane of pear too! The food looks great! That's an interesting point about fussy eaters - I tend to avoid eating with fussy eaters anyway if I can help it!